After a period of above-average growth, Washington State has seen a modest slowing in employment growth, but we continue to add jobs at a respectable rate. The State unemployment rate was measured at 5.3%, marginally above the national level, but it is trending in the right direction. Although growth continues to be uneven across the state, there are some encouraging signs which suggest that all of our main metropolitan areas should see positive job growth for the foreseeable future. • There were 22,207 home sales during the third quarter of 2015, up by 14.1% from the same period in 2014. • For the first time in several years, there were no counties that saw annual decreases in home sales. • The growth in sales was most pronounced in Kittitas County, and all but two counties saw double-digit percentage increases from the same period last year. • The lack of available inventory in the region continues to be a concern. 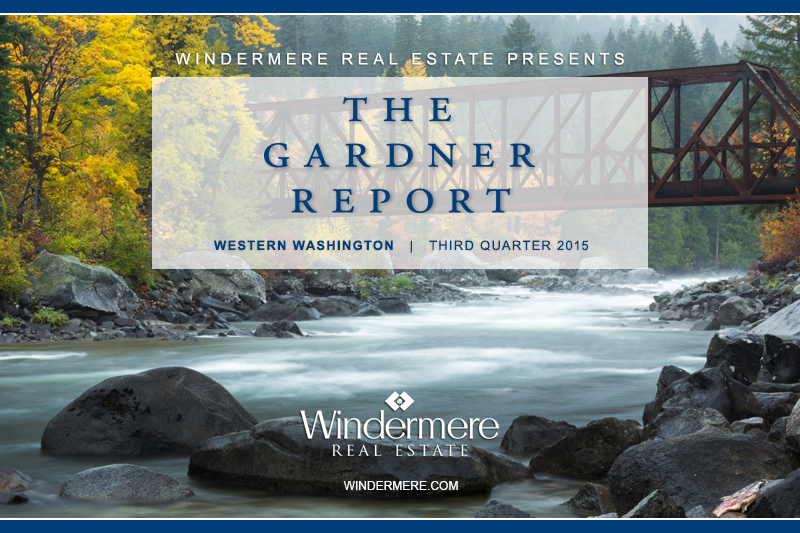 Listings in the third quarter were down by 18% from the second quarter, and down by 24.5% from the third quarter of 2014. • Prices in the region rose by an average of 6.3% on a year-over-year basis and were 9.6% higher than seen in the second quarter of 2015. • The only county where home prices fell on an annualized basis was in Kittitas County, but the drop was a minuscule 0.5%. Kittitas County saw sale prices grow by 5.8% between the second and third quarters of this year. • When compared to the third quarter of 2014, San Juan County showed the fastest price growth with an increase of 14.6%. Double-digit percentage gains were also seen in four other counties. • As long as inventory constraints persist, it is likely that price growth will continue. However, if interest rates rise in 2016, as they’re expected to do, we will likely see price growth slow. • The average number of days it took to sell a home dropped by nine days when compared to the third quarter of 2014. • It took an average of 74 days to sell a home in the third quarter of this year—down from 84 in the second quarter. • There were just two markets where the length of time it took to sell a home did rise, but the increases were minimal. Jefferson County saw an increase of eight days while Mason County rose by two days. • King County remains the only market where it takes less than a month to sell a home. This speedometer reflects the state of the region’s housing market using housing inventory, price gains, sales velocities, interest rates, and larger economics factors. For the third quarter of 2015 I have moved the needle a little farther in favor of sellers. Although sales did slow between the second and third quarters, I attribute this to a lack of inventory rather than any other factors. Additionally, interest rates dropped between the second and third quarters, which made buying more favorable. The persistently low levels of inventory in the region remain a concern. Such an imbalance between supply and demand is unsustainable. When I look at the ratio between listings and pending sales there are some counties with less than two months of inventory, which is troublesome. Any number below four months is certainly considered to be a seller’s market and, in my experience, a prolonged period of time with less than six months of inventory results in an unstable market. In normal housing market cycles, when such an imbalance exists we could expect home builders to fill in the gap with inventory, but this has not happened thus far. Unless we see a rapid escalation in construction activity, the market will remain remarkably tight well into 2016. Matthew Gardner is the Chief Economist for Windermere Real Estate, specializing in residential market analysis, commercial/industrial market analysis, financial analysis, and land use and regional economics. He is the former Principal of Gardner Economics, and has over 25 years of professional experience both in the U.S. and U.K. You’re welcome to download and view the full PDF report for more information. This blog was originally posted on the Windermere Blog.